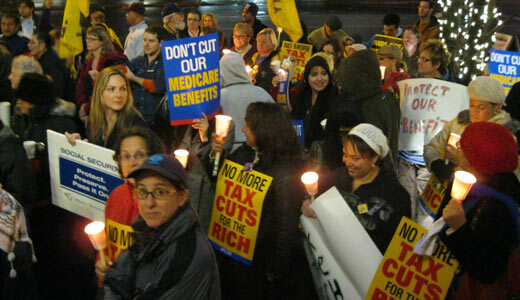 Connecticut union, retiree, community and clergy groups sent a clear message to Congress and the president in two candle light vigils: end tax breaks for the rich, and no cuts to Social Security, Medicare and Medicaid. 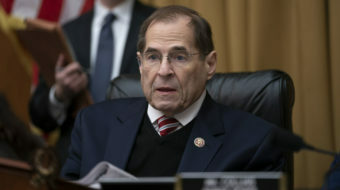 The Hartford and Stamford events, attended by over 100 each, were part of a national day of action coinciding with negotiations in Washington around the so-called fiscal cliff. Connecticut organizers are the AFL-CIO, SEIU, MoveOn and state-wide community groups. Workers in Stamford also called for comprehensive immigration reform and were joined by a local immigrant rights organization..
A construction worker now on disability spoke against raising the eligibility age for Medicare. After 40 years on the job, he said, it is no longer physically possible to continue. “Do the right thing, Joe!” chanted the crowd of all ages. In 1997 Lieberman was one of 12 Democrats to vote with Republicans in favor of increasing Medicare’s eligibility age. Last year he spoke in support of increasing the Medicare age to 67 as part of the bi-partisan Lieberman-Coburn plan. The retiring Senator did not deploy anyone to meet with the crowd. Union leaders attempted to deliver a letter and post cards to him. After a vicious election campaign in which Social Security was a major issue, tea party Republican Linda McMahon was defeated by Democrat Chris Murphy with the endorsement of the national Alliance for Retired Americans. 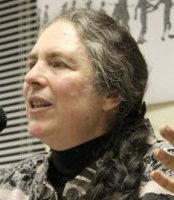 Connecticut Alliance for Retired Americans treasurer Lois O’Connor, a state worker for over 20 years, told about the poor house that her mother faced during the great depression. “We won’t go back,” she declared, warning against any cuts to Social Security. An 1199 member from Newington, one of 400 on strike for nearly a year against four Healthbrdge nursing homes, said this fight for dignity, security and fairness is a fight for the same values as their strike. She urged Congress to extend unemployment benefits before January 1. The national fight to tax the richest 2% is critical for Connecticut, where a special session of the Legislature has been called to address the state budget deficit. The wealth gap has grown faster here than any state in the last ten years. While Democratic Gov. 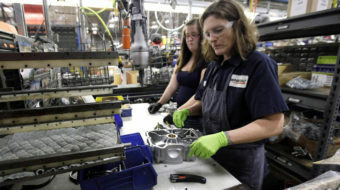 Dannel Malloy has called for cuts to services, a state wide coalition is urging an increase in revenues by taxing top incomes more. The richest households now pay a lower percentage of their income in taxes than all other categories. Public support for increasing taxes on the rich was strong in Hartford, where bystanders at the bus stop near the rally eagerly signed postcards calling for an end to the Bush tax cuts for the wealthiest 2%, no cuts to Social Security, Medicare and Medicaid, maintaining unemployment benefits, putting Americans back to work rebuilding infrastructure, renewable energy and public safety, and transferring pentagon funds and converting military production and jobs.